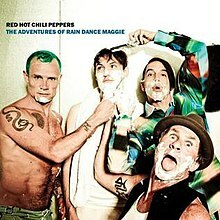 "The Adventures of Rain Dance Maggie" is a song from the Red Hot Chili Peppers' tenth album I'm with You and was the first single released from the album. It is their first single released since "Hump de Bump" in 2007 and the first single released with new guitarist Josh Klinghoffer. The song was released to radio on July 15, 2011, three days earlier than expected, due to an accidental release. The digital download was made available on July 18 while the CD single was released four days later. (2007) "The Adventures of Rain Dance Maggie"
The single became the band's record-holding 12th number-one single on the Billboard Alternative Songs chart where it spent four straight weeks atop the chart. The song's bass-line was conceived in bassist Flea's kitchen. Anthony Kiedis notes that "When I first heard [the song], I didn't know it would be a single. [But] I knew that I loved the jam. [...] I took it home and it felt so fun to listen to at length that I literally left it on in my driveway, opened the door and danced with the tree next to me for quite a while. I had no idea that it would even be a song, I just thought, 'Oh, this is a great dance track. Let's put it on as a B-side, [an] hour long.' And then, as fate would have it, people heard it, and they were like, 'Oh, that's your best thing right there. That's your best thing.'" When asked about who exactly Maggie is, Kiedis said that he is not about to reveal his inspirations. "It's just a collection of memories and people along the way that had maybe left my consciousness until I heard that music, and then they kind of came dancing back into my consciousness, and out the old pen onto the paper. "Names have been changed to protect the innocent. Although there is a Maggie, I realized later. There's two Maggies, actually." Flea was asked about the single and said that he was not really good at picking singles and really did not know which song was good to be released first. He described the song as a cool, simple, funky little jam but being completely different from the rest of the songs on the album and nothing else sounds like it. Flea stated that the band wrote 70 songs so not even necessarily all the best songs made it onto the album, just the ones that occupy their own space. On June 23, 2011, it was announced that hip hop artist Kreayshawn had been picked to direct the music video. Kreayshawn told MTV that she was shocked when the band's label contacted her management about directing the video. She said she went to film school but never thought it would translate to something this big. In the end, her footage was not used as the band did not think the video related to the meaning of the song. On July 30, 2011, the band took to the rooftop of a building in Venice Beach, California to shoot a second version of the music video with director Marc Klasfeld. On August 14, 2011, actress Melanee E. Nelson  discussed the concept of the Kreayshawn video. Nelson was told by a Warner Bros representative that the video is unlikely to be released and that the band was going in a different direction. Nelson said the video took place in a 1990s underground setting where she played a girl who knows everyone and features many antics with a geek-type character. Nelson said the geek character's drink gets laced with something so there were fantasy scenes involving a goat and it raining inside the club. She said she also heard animation was going to be added later. Each band member also played different characters in the video. Chad played the bouncer, Flea played the bartender while Anthony and Josh play paramedics. The band decided to go with the Marc Klasfeld-directed video rather than the Kreayshawn version and it is unknown why they opted to use a different director when re-shooting the video. Klasfeld spoke about the concept behind the video, saying it was simple and iconic. He said that Anthony Kiedis was inspired by The Beatles 1969 rooftop performance. Klasfeld said of filming on a rooftop that they were a bit worried because they had no safety net and worried about the band going too close to the edges, but they were professionals and had no problems. The video was released on August 17, 2011, through MTV.com and the band's website. MTV aired the United States television premiere of the video on the same date at 7:53 pm Eastern Standard Time, which was followed by a live Q&A with the band answering fan questions through Twitter on MTV.com. The video was named the 30th best of the year by VH-1 in their annual year-end countdown of the top 40 videos of 2011. In October 2011, the video reached number one on their weekly video countdown, where it held that spot for a few weeks. Artistdirect gave the song 5 out of 5 stars, describing it as "pure funk rock genius" and commenting how the song feels like it came back in time from the future. They describe the lyrics of the song as "otherworldly and captivating". Rolling Stone gave the song 3 out of 5 stars, calling it "everything you want from the Chilis" and commenting that Kiedis "woos a wild child with the type of come-ons only he can deliver with a straight face". About.com gave the song 4 out of 5 stars, praising the song for its "Strong, sensual guitar solo from Josh Klinghoffer", "Stripped down funky rock feel" and "Solid, singalong chorus". They conclude by calling the song "solid preview" for I'm With You. The song reached number one on the Billboard Rock Songs chart. On August 10, 2011, the song became the band's record holding 12th number one single on the Billboard Alternative Songs chart where it spent four straight weeks atop the chart. Rolling Stone named the song the 50th best of 2011 in their annual Top 50 singles list. The band's label had set a worldwide release date of July 18, 2011 for the single. A special Facebook page was set up where fans could RSVP to an online event where they would be the first to hear the new single, get the latest news and be the first to buy the digital download. On July 15, 2011, the single was briefly made available through an accidental leak on the band's website but quickly removed moments later. However, it was up long enough for someone to record it and transfer it throughout the Internet, through the unofficial forum stadium-arcadium.com. A member there leaked it onto YouTube through invite only, which soon got made public. Due to the leak, which was a low quality version of the single, the band's label decided to go ahead and release the single to radio that same day and also released the only high quality version at the time to the website of KROQ-FM. The label still celebrated the July 18 worldwide release as the official release date of the single to the band's website, Facebook page, YouTube and through digital download. In an interview with Zane Lowe, Flea discussed the leak even further by saying "The only thing that I would ever worry about would be if I was lazy or I didn't really take my time in the songwriting process to make the music as good as I thought it could be. That's the only thing I ever fret about because I do have a lazy streak. Anything that happens once the music is done, come what may." As of April 16, 2017, The Adventures of Rain Dance Maggie has been performed 212 times. It is a common song on The Getaway World Tour, and was also performed at nearly every show on the I'm With You Tour. Flea provides the backing vocals live. Since the departure of touring percussionist Mauro Refosco, the cowbell break in the song has been played by drummer Chad Smith. ^ "Red Hot Chili Peppers' rebirth – Page 2". Los Angeles Times. Retrieved August 6, 2011. ^ a b 7/18/11 (July 18, 2011). "Red Hot Chili Peppers Reveal Origins Of 'Rain Dance Maggie' – Music, Celebrity, Artist News". MTV. Retrieved August 6, 2011. ^ a b "Newsbeat – Red Hot Chili Peppers 'not bothered' about single leak". BBC. July 20, 2011. Retrieved August 5, 2011. ^ "Red Hot Chili Peppers' New Video To Be Directed By ... Kreayshawn? – Music, Celebrity, Artist News". MTV. June 23, 2011. Retrieved August 5, 2011. ^ 6/30/11 (June 30, 2011). "Red Hot Chili Peppers Video 'Crazier' With Kreayshawn Calling Shots – Music, Celebrity, Artist News". MTV. Retrieved August 5, 2011. ^ "Red Hot Chili Peppers filming latest video tonight on a Venice rooftop". Los Angeles Times. July 30, 2011. Retrieved August 5, 2011. ^ "A new beginning for the Chili Peppers". Los Angeles Times. August 5, 2011. Retrieved August 5, 2011. ^ Stadium-Arcadium.com on August 15, 2011 (August 15, 2011). "Adventures of Rain Dance Maggie Music Video by Kreayshawn Scrapped Red Hot Chili Peppers I'm With You". Stadium-arcadium.com. Retrieved October 8, 2011. ^ Elias, Matt (August 16, 2011). "Red Hot Chili Peppers' 'Maggie' Director Aimed For 'Simple And Iconic' – Music, Celebrity, Artist News". MTV. Retrieved October 8, 2011. ^ "Video Sneak Peek: Red Hot Chili Peppers, 'The Adventures Of Rain Dance Maggie' » MTV Buzzworthy Blog". Buzzworthy.mtv.com. August 15, 2011. Retrieved October 8, 2011. ^ "Red Hot Chili Peppers "The Adventures of Rain Dance Maggie" Song Review — 5 out of 5 stars - ARTISTdirect News". Artistdirect.com. Retrieved June 7, 2012. ^ Simon Vozick-Levinson (July 18, 2011). "The Adventures of Rain Dance Maggie | Song Reviews". Rolling Stone. Retrieved June 7, 2012. ^ "Review: Red Hot Chili Peppers - The Adventures Of Rain Dance Maggie". Top40.about.com. Retrieved June 7, 2012. ^ "Readers' Poll: The Best Albums of 2011". Rolling Stone. ^ "Certificazioni Download FIMI" (PDF) (in Italian). Federation of the Italian Music Industry. Archived from the original (PDF) on June 5, 2012. Retrieved January 2, 2012. ^ "The Red Hot Chili Peppers' New Single "The Adventures of Rain Dance Maggie" From Their Upcoming Album, 'I'm With You'". Kroq.radio.com. July 15, 2011. Retrieved August 5, 2011. ^ Stadium-Arcadium.com on July 21, 2011 (July 21, 2011). "The Adventures of Rain Dance Maggie CD Single Pictures Red Hot Chili Peppers I'm With You". Stadium-arcadium.com. Archived from the original on July 24, 2011. Retrieved August 5, 2011. ^ "Red Hot Chili Peppers The Adventures Of Raindance Maggie RARE promo acetate CD". eBay. February 21, 2012. Retrieved June 7, 2012. ^ "Ultratop Belgian Charts". ultratop.be. Retrieved October 8, 2011. ^ a b c d e f g "The Adventures of Rain Dance Maggie – Red Hot Chili Peppers". Billboard. Retrieved July 29, 2011. ^ "ČNS IFPI" (in Czech). Hitparáda – Radio Top 100 Oficiální. IFPI Czech Republic. Note: Change the chart to CZ – RADIO – TOP 100 and insert 201135 into search. Retrieved November 16, 2018. ^ "Archívum – Slágerlisták – MAHASZ" (in Hungarian). Rádiós Top 40 játszási lista. Magyar Hanglemezkiadók Szövetsége. Retrieved August 3, 2011. ^ Felix Fiedler. "Media Control Gfk International". Media-control.com. Archived from the original on October 6, 2011. Retrieved October 8, 2011. ^ "Red Hot Chili Peppers Chart History". RÚV. Retrieved June 19, 2017. ^ "Media Forest: Airplay chart". mediaforest.biz. August 13, 2011. Archived from the original on September 5, 2012. ^ "Italiancharts.com – Red Hot Chili Peppers – The Adventures Of Rain Dance Maggie". Top Digital Download. Retrieved August 3, 2011. ^ "The Adventures of Rain Dance Maggie on Slovenská". IFPI. (IFPI). Retrieved February 10, 2011. ^ Steffen Hung. "Schweizer Hitparade – Singles Top 75 09.10.2011". hitparade.ch. Retrieved October 8, 2011. ^ "UK Singles Chart – July 24, 2011". UK Charts Company. Retrieved July 24, 2011. ^ "Japan Hot 100 – Year-End 2011". Billboard. Retrieved August 5, 2018. ^ "MAHASZ Rádiós TOP 100 2011". Mahasz (in Hungarian). Retrieved February 22, 2012. ^ "Alternative Songs – Year-End 2011". Billboard. Retrieved August 5, 2018. ^ "Rock Songs – Year-End 2011". Billboard. Retrieved August 5, 2018. ^ "Mainstream Rock Songs – Year-End 2011". Billboard. Retrieved August 5, 2018.